(Nanowerk News) Cancer cells often break free from their original locations and circulate through the bloodstream, allowing them to form new tumors elsewhere in the body. Detecting these cells could give doctors a new way to predict whether patients’ tumors will metastasize, or monitor how they are responding to treatment, but finding these extremely rare cells has proven challenging because there might be only one to 10 such cells in a 1-milliliter sample of a patient’s blood. A team of engineers from MIT, Penn State University, and Carnegie Mellon University is developing a novel way to isolate these cells: using sound waves to separate them from blood cells. Their new cell-sorting device is 20 times faster than the original version that they first reported last year, approaching the speed that would be necessary to make it useful for testing patient blood samples. The researchers have also demonstrated that the device can successfully capture circulating tumor cells from patient samples, which could enable many clinical applications as well as fundamental research on how these cells escape from their original tumor site. Ming Dao, a principal research scientist in MIT’s Department of Materials Science and Engineering; Subra Suresh, president of Carnegie Mellon and, at MIT, the Vannevar Bush Professor Emeritus of Engineering and a former dean of engineering; and Tony Jun Huang, a professor of engineering science and mechanics at Penn State, are senior authors of a paper describing the device in the Proceedings of the National Academy of Sciences the week of April 6 ("Acoustic separation of circulating tumor cells"). The research team also includes the lead author, Peng Li, a postdoc at Penn State; Zhangli Peng, a former MIT postdoc who is now an assistant professor at the University of Notre Dame; and Joseph Drabick, a professor of medicine at Penn State’s Hershey Cancer Institute, among others. Learn how the researchers' novel device uses sound waves to separate rare circulating tumor cells from blood cells. Most existing cell-sorting technologies require tagging cells with chemicals or exposing them to strong mechanical forces that may damage them. 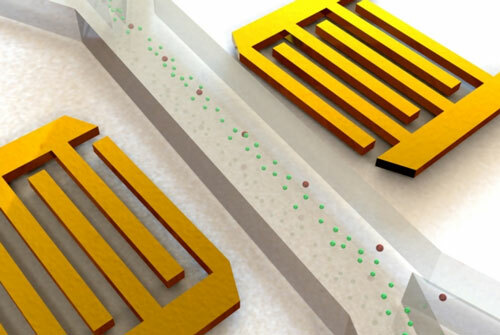 To sort cells using sound waves, which offer a gentler alternative, the researchers built microfluidic devices with two acoustic transducers, which produce sound waves, on either side of a microchannel. When the two waves meet, they combine to form a standing wave (a wave that remains in constant position). This wave produces pressure nodes, or lines of low pressure. Because the sound waves are tilted so they run across the microchannel at an angle, each cell encounters several pressure nodes as it flows through the channel. As cells encounter each node, they are pushed further to the side of the channel; the distance of cell movement depends on their size and other properties, such as compressibility. In the previous study, the researchers were able to separate cancer cells from red and white blood cells, but the sample flow rate through the device was only 1 to 2 microliters per minute. At that rate, it would take more than 50 hours to process a typical patient sample of about 6 milliliters. The new version of the device has a working flow rate about 20 times faster, allowing it to process a patient sample in about five hours. To achieve this, the researchers used computer modeling of cell trajectories, confirmed by experimentation, to adjust some of the device’s other features, including the tilting angle — the angle at which the sound waves strike the channel — and the distance over which the cells are exposed to sound waves. The researchers tested the new acoustic device with samples consisting of a mix of cancer cells and white blood cells grown in the lab. In these studies, they were able to isolate at least 83 percent of the cancer cells from samples that had as few as one cancer cell per 100,000 white blood cells. The device also performed well in tests of blood samples from three breast cancer patients. From those samples, the researchers isolated one, eight, and 59 tumor cells, respectively; the first sample was from a patient who was responding very well to treatment, and therefore had few tumor cells circulating. Their results were similar to those from a commercially available device that can sort cancer cells; however, that device damages cells so they are not viable for further studies, Dao says. In contrast, the acoustic technique is very mild and does not require the cells to be tagged with magnetic beads, antibodies or any other molecules, so they are ideal for further analyses once isolated. “With further improvements in cell throughput, this work could offer a useful new tool, for both basic research into the complex topic of circulating tumor cells and for clinical assessment of different types of cancer,” Suresh says. The new system’s success in sorting patient samples represents a “significant advance” over the team’s original device, says Taher Saif, a professor of mechanical science and engineering at the University of Illinois at Urbana-Champaign who was not part of the research team. “Now one can imagine a product that could be implemented based on the design they have come up with,” Saif says. The researchers are now working on further improving the device’s flow rate, as well as making it more robust and cost-effective. The research was funded by the National Institutes of Health, the National Science Foundation, and the Penn State Center for Nanoscale Science.